A bunch of (at least) middle-aged mercenaries aim to rescue the imprisoned President of an African State. Did you hear about the one with an Englishman, an Irishman and a Welshman who signed up for shared top billing for a 1978 movie? The film of course, The Wild Geese (1978) and the stars – in no particular order – Roger Moore, Richard Burton and Richard Harris. These stars heading a then controversial film, as made in South Africa during the time of apartheid. Supported by a cast of actors including Stewart Granger, Hardy Kruger and Frank Finlay. With character actors – you’ll kick yourself at not recognising – including Kenneth Griffith and Winston Ntshona. Ronald Fraser making this a totally British movie as Scot, Jock McTaggart. The film starts with the title track, Flight of the Wild Geese. The lyrics – written and sung by Joan Armatrading – annoyingly gives some of the plot away. So moving on swiftly – so you don’t have time to check this song out – let’s talk about this movie. Cue Richard Burton as one time just British Army Colonel, now mercenary, Allen Faulkner. On arrival in London the grumpy, Faulkner arrives from his first class flight with an unsigned cheque. The flight paid and cheque duly signed by Sir Edward Matheson (Stewart Granger), a merchant banker who wants to enrol Faulkner’s services as a mercenary. This despite Faulkner’s last gig not working out as planned, as seen in a nifty wee tell all flashback. The men then discuss how President Limbani was overthrown by a dictator General Ndofa, and is now imprisoned awaiting execution in Zembala. Matheson hopes Faulkner will rescue Limbani, and bring him to London. With Matheson, not doing this for all the right reasons, as he hopes he can use Limbani as a bargaining chip with copper mine assets at stake. Faulkner asked to assemble a team of men, with these fifty men assisting in this mission. Faulkner barks his orders of who and what he needs (in a way that only Burton can). Faulkner agrees as long as this team includes his two best mercenary buddies. These men are Capt. Rafer Janders (Richard Harris) an Irishman with his knowledge of explosives (and it seems always with a grenade handy). And English Shawn Fynn (Roger Moore) the other, due to his extensive range as a pilot. Fynn’s impressive introduction includes the fact he is able to fly any plane. Janders introduced as a single father, to the most precocious and annoying on screen child since time began. Janders now an art dealer, has promised son Emile a skiing trip over Christmas. Which Emile is more than superexcited about, with him annoyingly yahoooing (as kids don’t do). The kid is sent out the room, while the men talk business. It’s apparent that this mercenary gig appeals to Janders, and he agrees to take part with his idealist past reawakened. Meanwhile Fynn gatecrashes a 1970s party. There Fynn deals with some mobsters and in doing so impersonates Michael Caine, with a Get Carter(1971) throwaway line. Saying this as revenge for the death of a teenage girl. With him leaving the mobsters in a sorry state with Fynn now a marked man. His death threat called off with the increasingly shady Matheson talking to the powers at be. So the trio then call on some old army buddies, and then hold the equivalent of a X Factor (2004) audition for the job. With the men interviewing for this job in front of these men. However the trio’s friends are also enrolled. Sgt Major Sandy Young (Jack Watson) joining willingly, possibly as a possible escape from his nagging wife and suburbia. Boer Lieutenant Pieter Coetzee (Hardy Kruger) also recruited, despite his apparent racist feelings. Once the final fifty are signed up, these men discover the plans have changed with Christmas Day the now planned rescue date. This new date means the men leave much earlier than expected. It leads to a heart breaking scene with Janders and son, Emile. With their farewell not going as Janders hoped, as he visits his son at boarding school. On telling him the news, the boy runs away from him. The Christmas presents, Janders brought unopened. Janders not hearing his son tell him he loves him as he runs from him. Janders asks Faulkner to look after his son, should anything happen to him. Soon after the men parachute into Zembaya. These followed by some training scenes. All goes as planned with half of the men capturing Limbani from the Simba guarded prison, the other half gain control of the airport. With the men awaiting the flight home, an aeroplane is spotted. It comes in as if to land, then takes off again. It seems Matheson may have double crossed them… and for more on this adventure tune in to the film for the gripping second half. it is wonderful to see this ensemble of actors sharing the screen and I feel all these men shared a great camaraderie. All showing a wonderful on-screen respect, rapport and relationship. With these attributes reportedly just as good off-screen. Roger Moore tells of off set pranks between him and Harris. He adds that he was in awe working with Stewart Granger, his one time film idol. But these actors were all fabulous and showing their talents in their own unique ways. Their chosen roles shows just how well these actors were selected. Each of these actors in a role that befitted their persona, which they played as an ensemble rather than jostling for the limelight. With the headlining trio it was good to see Moore with some fun quips, orders barked by Burton and a more sensitive acting piece from Harris. The film was a wonderful movie in that it encapsulated the characters with both back stories and shared their part in this tale. This making the characters more than a caricature, and as more rounded and stronger characters knowing their full story. Janders character was particularly well drawn with this with a touching and heartrending performance from Harris. Their scenes showing a more human side to his mercenary character, and one who hoped to take part for the right reasons. After seeing Stewart Granger in the initial scene, I feared this his first and last with his apparently villainous character. I was happy to see this actor reappear at times throughout the movie. His small but pivotal role expanded in the second half of the film. It was interesting to learn his character was initially to be played by Joseph Cotten. Others turning down roles included Burt Lancaster and Michael Caine and those considered included O J Simpson and Stephen Boyd. I particularly liked how the film storyline chopped and then changed to a different kind of film after the men deserted by the plane. This unseen twist changing the plot made the second half more compelling than the first. Where the men were now in a battle of survival against the Simbas, that they didn’t anticipate or prepare for. This story line led to casualties on both sides, and this adding to the poignancy of the story. More of the happenings back home in London, added to the plot in a chilling and frightening way. I would have loved instead of a sequel to this film, to have a prequel. Perhaps showing these men as they first came to know each other. This film’s sequel, Wild Geese II (1985) initially was to have starred Burton, until his passing just before filming. Moore had turned the film down for the less credible plot. The main thing that irked me about The Wild Geese was the title track. not only for those spoilers but for its presentation. Seeming as out of tune with this movie – as the title track for another film of this year, The Legacy (1978) – and sounding more like a James Bond theme than a thrilling adventure movie. This musical should have been cut from the film like Fynn’s love interest, a plot device which I was happy to see was removed from the storyline. This as it would have distracted from the tone and pace of the film. The Wild Geese may feel like a more credible British testosterone filled Expendables film made in the 1970s. The Expendables (2010) cast primarily with favourites from American action films, this movie compared more favourably with British acting greats from all genres in those starring roles. 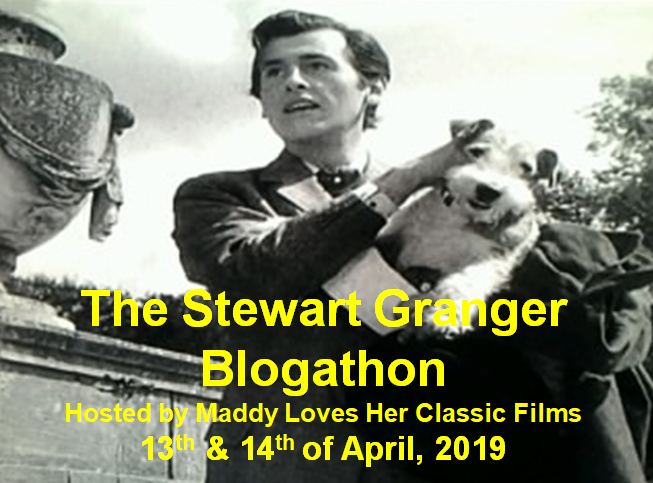 This review was entered into Maddy Loves Her Classic Films Stewart Granger blogathon. Other films with this cast include Richard Harris in The Cassandra Crossing. Richard Burton stars in The Medusa Touch and Anne of a Thousand Days. He was also featured in a blogathon tribute last year on this site. Roger Moore starred in North Sea Hijack and The Cannonball Run HERE, about his car and HERE as a main review. Roger Moore is also reviewed in Bullseye, The Man who Haunted Himself, A Princess for Christmas and The James Bond Films HERE in his In Memoriam tribute post. Stewart Granger starred in Hotel, The Love Boat and Murder She Wrote. Jack Watson in All Creatures Great and Small and North Sea Hijack. I always thought this movie was underrated, and you nailed it about it completely changes when the pilots get the “pass them by” order. Its a great film, I’d seen it years ago but had to rewatch after seeing the cast. Fantastic! Love this great action adventure. All the cast were excellent but I will always have a soft spot for the Richards: Burton and Harris. Me too, I loved finding out more on Burton’s movies when I ran a blogathon on him last year. And Harris, is always fantastic especially in The Cassandra Crossing. I remember watching The Wild Geese as a child and just loving it. There are certainly some memorable scenes and the dialogue has become funnier over the years. Lots of witty, sarcy banter that is music to the ears after years of dull, moronic action movie scripting. It may be a product of the Seventies, but boy is this still entertaining. Thanks Paul and I totally agree these 70s films are so much more entertaining than some of the modern action films. This is such a silly, but fun film. It’s good escapism. The great cast make this worth a watch. Stewart is a good villain. Love the friendship between Richard Burton, Roger Moore and Richard Harris’s characters. For me the Sergeant Major steals the show! 🙂 Hilarious. Granger played a great character and did adore how his character developed. Ha! No, I don’t mind and it doesn’t matter. The title tune. Geesh, I thought giving away the entire movie in a song left us with the era of 1950s westerns. The trailer is just as bad, find out more or less everything.